> Plan It With Sass! Have you ever heard someone say "I tried to go vegan but I was always so tired" or "The vegan diet made me sick" or "I didn't get enough protein on the vegan diet so I had to start eating meat again." As a long-term Vegan and Nutritional Consultant, it's concerning to see statistics like this: "Researchers at the Humane Research Council found that as many as 84 percent of vegetarians and vegans go back to consuming animal products at some point." 84%?! Whoa. That's a major majority, folks. What's the point of going vegan (for your health, for the animals, for the environment— insert your reason here) if you're not going to learn how to do it right? To stay on track with your vegan lifestyle for years to come you need to learn what a balanced vegan diet looks like. You need to know without a doubt which foods to eat (or supplements you need) each day to ensure you're getting the nutrients to support your good health for the long term. What you learned about The 4 Food Groups doesn't exactly help when you go Vegan, does it? Remember those posters making an appearance in every classroom when you were a kid? You know the ones, with pictures of cows and milk and eggs? Somewhere along the way you decided to check out the vegan diet. All hell broke loose, didn't it? Suddenly it feels as if you're in a new world where you don't speak the language. You understand the vegan diet means no dairy, meats, or eggs, but you have no idea what else there is or how to pull it together into meals you can feel good about eating. I mean, you might not really love vegetables. You probably don't have a lot of experience cooking with whole grains (and everyone seems to think grains are evil—are you even supposed to eat them?). And the only beans you've had are in chili or refried next to some Mexican food. And what are you supposed to make of soy? You've heard conflicting advice—should you even eat it? And what about nuts? And seeds? Aren't they fattening? And even if you had a solid idea of the foods that can replace what you're used to, you don't have any idea how much of each of them you're supposed to eat every day. It's all just so overwhelming. You just want to find a way to move to a diet filled with these new vegan foods in a way that doesn't interfere too awfully much with your life. Is that even possible?! My friend, it's time to put an end to that deer-in-the-headlights feeling that's brought you this confusing place where you're not moving forward—you're feeling stuck and paralyzed with fear of making a mistake. Gain a thorough understanding of WHY to choose certain foods over others. 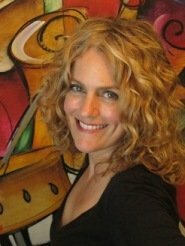 I'm a long-time vegan chef, Nutritional Consultant, and publisher of VeganCoach.com. I created Plan It With Sass! to help people just like you who are ready to start making sense of their vegan diet with less effort, confusion, and most of all less time. And I have helped hundreds of people learn how easy it can be to plan vegan meals. Complete confusion if you conduct any amount of research whatsoever. The conflicting advice out there is mind boggling. How can you possibly discern what is correct and who to believe and trust? Busy lives mean you don't have the time to devote to learning the vegan ropes. After working all day, trying to find some time for exercise, cleaning your house, cooking, spending time with family and/or friends, and trying to get it all done before it's time to go to bed and start all over again? Oy vey! It's exhausting, isn't it? Who has time for any extras? Your everyday actions should bring you closer to your goal, not drive you away because things are too difficult and overwhelming. So I created a course to help people just like you who are ready to start making sense of their vegan diet with less effort, less confusion, and perhaps best of all less time spent trying to figure it all out. Welcome to Plan It With Sass, one of our on-demand and online vegan meal planning courses. In Plan It!, I'll teach you exactly WHAT to eat every day—and WHY! You'll wake up each and every day with a clear idea of the vegan ingredients that are part of a well-balanced vegan diet. It's easy, fun, and it completely eliminates confusion. I'll give you a tried-and-tested road map to follow that pinpoints the many advantages of the vegan diet—as well as those places you need to pay special attention to—so you can feel good and comfy with your decisions. As you go along on your journey, you'll learn to discern fact from rhetoric, discover what it means to eat a healthy and well-balanced vegan diet, pull together a grocery list in minutes, and learn how to easily make a tasty meal based on the foods you love. It will be easy for you to stick to your guns and remember the reason you chose vegan in the first place. 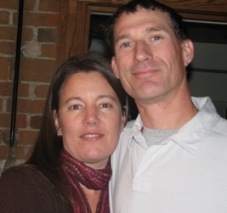 "We truly think this is a life-changing course. "When we first starting reading up on vegan issues we were overwhelmed by all the information - all the things we "needed to know" seemed so daunting. The info in this course convinced us that it's not only possible but actually not so difficult at all to change our eating habits altogether. 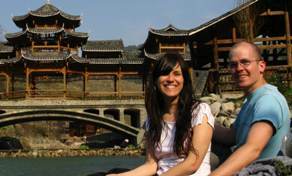 "This course has really become a bible for us and has changed our lives! We wish everyone knew that adopting a healthier, more humane way of eating is way easier than most people think!" "Sassy does not just assume that the student already knows all the basics; she explains everything from the ground up, which is essential for newbies, and a great refresher for long-time vegans. "Sassy's writing voice is friendly, bubbly, understanding, and nonjudgmental. I felt like I was getting great advice from a caring, well-informed friend." ...I've been through this phase myself! And I've coached hundreds of clients and students over the years with my step-by-step easy to understand and follow program. You'll begin to learn how simple it is to get from where you're at now to where you want to be—confident in your new food choices. As your Coach, I'll take you by the hand and show you the sights, explaining the hows and the whys of various food choices as well as how to incorporate them into your life including shopping and cooking tips you won't find anywhere else. You'll learn everything you need to know so you can make knowledgeable decisions when it comes to your vegan diet. You'll change how you view your meal planning (don't worry, it's easy to learn) so you can have fun and eat what you love! As you make your way through our online course, we’ll cover the food groups you should include in your healthy vegan diet, including the amounts of each food group to shoot for each day. We'll also have in-depth discussions about protein, carbohydrates, calcium, fats, and so much more. Then we'll work our way along in easy-to-digest Lessons as you learn exactly what it takes to create healthy vegan meals from beginning to end. 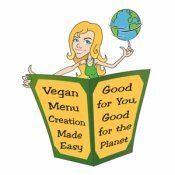 In fact, I'll teach you how to create your very own vegan menus from scratch with 100% flexibility based on the most current recommendations from top doctors and Dietitians -- I have done all the research so you can feel empowered and confident as you make your way on your vegan journey well into the future. With Plan It! new foods are introduced one at a time. As you move through the course each week, you will be encouraged to add (or remove) certain foods from your everyday routine. This might require learning new cooking skills or purchasing ingredients you might not have just yet. Simply sit back and relax as each week a new Lesson is available to you in our online classroom. Everything fits together like a nice neat puzzle. And all you have to do is follow along and do your homework. 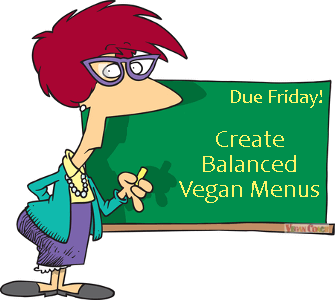 By the time you make your way to the end of this course, you will have a firm grasp on which foods should appear on your own personally customized healthy vegan menus. The course concludes with our 56-page downloadable Plan It With Sass! Meal Planning Workbook where you'll put everything you learned into practice as you create menus from scratch based on the foods and flavors that YOU love. Plan It Worksheet so you can practice creating menus geared to your own nutritional needs - print it up to fill it out, or use it in Excel for columns that calculate automatically. This Workbook took hours to pull together for you. It's important to me that you walk away with a thorough understanding of what can usually be dry material. Instead, you'll find the Workbook to be filled with interesting tips and advice delivered in a FUN way that will assist you in reaching your nutritional goals. 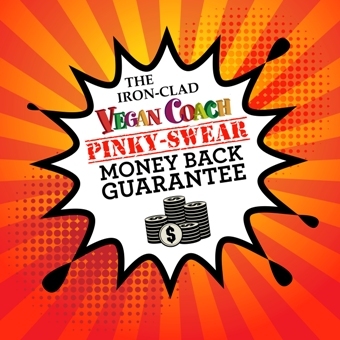 "I highly recommend to anyone and everyone seriously interested in the plant-based/vegan lifestyle that they don't hesitate to take this course and become a part of the "Vegan Coach community". Whether you're a long-time vegan or just a "fledgling plant-based wannabe", there is MUCH to learn, from this course! I promise you that you will feel like you're "home", and you will be VERY glad you're taking the plunge toward a much better and healthier life, not only for yourselves, but for this planet as well!" Plan It! is divided into 10 exciting and information-packed lessons delivered over the course of 8 weeks that will teach you how to build a vegan diet the smart way, along with a Menu Planning Workbook to help you put it all together. Lessons 1 and 2: We examine how and why Plan It With Sass! works, you'll view a Sample Menu, so you can begin with the end in mind. Then we'll move on to breakfast options that will get your day off to the best start possible and set you up for a health-promoting day ahead. You'll also learn about an important nutrient every vegan must include in their daily diet. Lesson 3: The focus on this lesson is adding raw leafy greens to your daily diet along with ideas for salads that you'll love and will actually want to eat each and every day. Lessons 4 and 5: Next, we'll take a deep dive into the darlings of the plant-based world fruits and veggies. Plus, you'll learn how to easily add an important whole food into your diet that improves your metabolism and energy (many vegans are missing this essential ingredient from their diet!). And we'll keep things moving along at a steady pace as we continue to build a well-balanced diet together. Lesson 6: This week we're talking protein. We leave no stone unturned as you learn how to figure out our very own protein requirements, the foods which contain the protein you need, working with beans and legumes and the proper way to prepare them to derive the most nutritional benefit, tempeh, tofu, and more! By the end of this lesson you will have a very good handle on protein in the vegan diet. Lesson 8: Our focus this week examines the carbohydrate myth of so many diets that only end up starving your body of essential fuel and nutrition. You will learn how to choose only those whole grains and pseudocereals that support your good health. We chat about gluten and whole grains and how to know which to add to your diet to ensure your good health (you might be surprised!). Lesson 9: Our focus this week is fats; the good, the bad, and the ugly. We go in-depth into fats including showing you how to figure out the amount of fat intake that is perfect for your unique self. Plus, a primer on various oils, how to go oil-free if you'd like, all about nuts and seeds and saturated, monosaturated, and polyunsaturated fats. Plus, discover a KEY nutrient that most vegans are not only missing but might not even know about! Lesson 10: This week we head straight into your downloadable 56-page Vegan Menu Planning Workbook that focuses on teaching you how to create a week's worth of menus that ties together everything that you've learned throughout the course. You'll also learn the ins and outs of running a vegan kitchen, sample grocery shopping lists, and so much more! In addition, you'll receive Plan It! Recipes, a 46-page downloadable eBook that includes all the recipes from the course! "At first I thought the weekly release of the lessons would make me lose interest but I'm thinking it is now the opposite. It means I have to actually keep looking at the material provided and not try to fast track any steps." Need a refresher? You can retake the course at any time. You'll always have access to your course. Come on back any time and go through the course again, ask for clarification about something, or share your successes with your new friends. Because the world of nutrition isn't static—it's ever-changing. As with all of our courses, Plan It! is updated regularly to reflect the latest and greatest so your experience will likely be a little different every time. These optional course-wide Discussions are a place for us to connect, which helps keep you on track. This means I'll be there every step of the way to answer questions and offer suggestions and encouragement as needed. Think of it as private coaching without the cost. These fun downloadable eBooks will help you along your journey during the course—and after too! In this fun little eBook, I'll reach into my fridge to see what I have on hand. Next, I'll create 4 separate meals with the exact same ingredients! You'll discover the reasons I made the choices I did for ingredients, seasonings and flavorings. We'll talk about flavor matching and substitutions, too! By the end of this book you'll have a better idea of how to use the ingredients YOU have on hand. Plus, you'll find a way to use those odds and ends sitting around in your fridge and cupboards. Using the quick and easy tips in Scratch It, you'll be on your way to creating vegan made-from-scratch meals without a recipe! Save time and money as you travel through the basics of FREESTYLE cooking. Wondering how to make a smoothie that is good for you AND tastes yummy? One of our mottos in these parts is the idea of freestyle cooking. And this goes for smoothie making, too! The KEY is to understand which ingredients make the healthiest smoothies. We don't want anything in your smoothie that isn't going to give you a nutritional bang for your buck. We'll review each of the ingredients I recommend in depth so you can understand what each one provides in terms of nutrition, taste, texture and more. Wondering how to eat out while sticking to your vegan goals? This FUN eBook teaches you how to walk into just about any non-vegan restaurant out there and order plant-based meals that you will love. Together we'll review 5 menus - The Breakfast/Brunch Place, The Southwestern Place, The Steak Place, The Burger/Mixed Bag Place and The Italian Place - and I'll show you how to order tasty 100% plant-based meals that even the chef didn't know he could make! Going vegan doesn't have to mean turning your back on good food or good friends. You just have to learn to make the best of a potentially awkward restaurant situation, and this book will help you to do just that. "I write 4 articles a week for an online newsletter. The content isn't vegan-specific, but there are lots of subscribers that do have that interest or follow that lifestyle, so I include vegan-oriented articles often. Lately I've been quoting you and sending folks to your website. I'll be continuing to do that. This has been a superb course. Your organization of your content has been outstanding, and I'm now ORGANIZED and have a consistent, sensible routine to follow--thanks to YOU! I'm so grateful I found you, and will continue to study your website. Thanks over and over again. It's been awesome." "Thank you, thank you, thank you (Yes, 3 times!) for all the wonderful information that you share. You are such a blessing to vegans! Although I have been vegan for years, I ordered your Plan it with Sass! course and totally love it! I was in a cooking rut and you have helped me expand my normal boring steam/bake/repeat menu into more flavorful, healthy, and "can't wait to eat - yummy" meals! So thanks x 3 and have a wonderful day!" "Thank you so much for providing the big picture. There are so many recipes out there, but the important thing is to have balance and know the essence of a dish, then add healthy flavorings. You have been a tremendous inspiration." Join us in class: If you complete the coursework and aren't happy for any reason, you get a 100% refund. If you'd like, I'll even hop on the phone with you for a free 1-on-1 private coaching session just to be sure you're getting the results. Why would I do this? Because here at Vegan Coach we truly care about your success! If you do the class homework (usually edible!) and go through the process, you WILL without a doubt feel further along in your whole food plant-based journey. How can I make this claim? Why do we stand so strongly behind what we teach you? Because we've been helping our students along since 2007! And one thing we hear over and over again is how much more they got for their money than they expected. Our classes are quite comprehensive! We want you to feel super comfortable with your decision to join us in class. You can feel secure in your purchase. We gotcha covered! Questions about Plan It With Sass! A: Maybe. Whether you've been vegan for a day, a year, or a decade, there are likely some things you already know and some things you don't about the vegan diet. Everybody is coming at this from different backgrounds, knowledge bases, and experience. 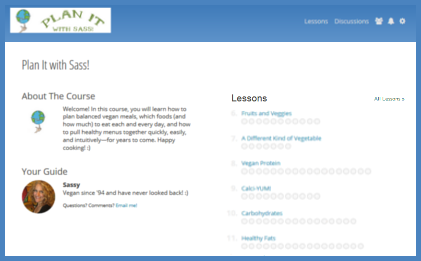 So for the purposes of this course, I assume you don't know ANYTHING about what a healthy vegan diet looks like. And in this way none of the information will fall through the knowledge cracks. That said, if you already feel crystal clear on what a well-balanced and well-rounded healthy vegan diet is and how to create whole-food based meals, then this course might not be for you. 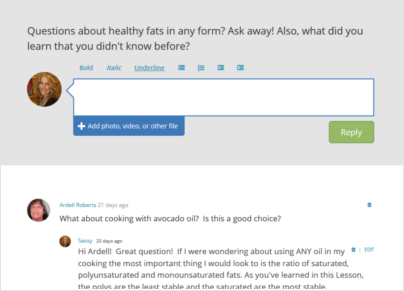 A: This course was designed to allow YOU complete control over the food you eat. You are given the information to use as you see fit. So CAN you still eat meat? Yes, if you desire. But will you NEED to eat meat? No, because you will learn the basics of building a healthy vegan diet so you can feel comfy letting go of the meat (and other animal products) when you are ready. A: If you choose the Self-Study option, you'll have access to the entire course at once. So you can pick and choose the topics you'd like to learn as time allows. If you choose the Self-Study or Private Coaching options, you'll receive an email each week to notify you that a new Lesson is ready to be viewed. You can simply visit our virtual classroom whenever you have the time (and the head space!) to concentrate and get the most out of each Lesson. Q: How much do you promote the use of tofu or "fake" meat? Will I be required to use wacky, hard to find ingredients that are not found in my local Albertson's? A: The recommended ingredients throughout the course are mostly basic whole foods, including veggies and fruit and beans and whole grains, etc. All foods which I believe you should have no challenges finding in your local grocery store. I don't recommend a diet focused on faux meats and cheeses and such, and it is not what I teach in the course either. The use of organic soy products (such as tofu and tempeh) are completely up to you, and are not necessary to create your very own menus (which are based on your personal likes and dislikes). Q: Is this available outside of the U.S.? A: Yes. Because this is an online course it is available worldwide. A: Yes! Ask below in our Facebook commenting section or shoot me an email through our Contact form. Or you can click here to Chat w/the Coach. Sign up for an available 20-minute time slot, and I'll give you a call to answer any questions you have about the class OR help you determine which of our courses would be a better fit for your current needs and plant-based skill level. Thanks! "Even though I have been Vegan for a while now, I've found that the information that Sass has presented in this course has opened my eyes to some things I wasn't aware of. I read every book and magazine out there for Vegetarians & Vegans, but this comprehensive course has really shown me that even as a "veteran" Vegan, there is so much out there to still learn and absorb about my diet to keep me healthy and active for years to come." You can start today to get a fresh, new idea of the food on your plate while you say goodbye to stress and confusion. Learn exactly WHAT to eat and WHY, how to stock your kitchen with the foods you love that will support you nutritionally, and make connections with a community of like-minds who offer support, inspiration, and understanding. You are going to love this easy, fun, vegan-friendly meal planning course. It's time to Plan It! "I just bought your Plan It with Sass! course. I wanted to tell you I love your work, it makes more sense than any other vegan writer I follow (and I follow a lot!). I especially like that you don't use the fake meats, only whole foods. Thank you for that." "I loved this course. I have been vegan for a couple of years but I still learned a lot from this course. It has helped me, in a short time, make some changes that I can already feel are affecting me in a positive way. I am ready to stock my cupboards and start planning meals!!" "I think your course was SO well organized, simple and non-threatening to a "new" vegan or someone exploring what it means to be vegan. The information, tips, recipes, etc. were so down to earth. The course definitely surpassed my expectations!" "The way you write makes it fun to read and try new things. I eat a very healthy diet and I like to cook but I tend to eat the same things over and over again. You have many easy, quick, good-for-me ideas." "Thank you so much for your website and sharing your expertise! I've been taking your menu planning course as well as your weight loss course. They are so helpful, and love the humor, too!" Back to the top - Plan It With Sass!